I got top 3 at DCD & another blog award!! I'm actually a little late posting this award from Clare! Had a busy weekend. It was my Mum & Dad's joint 60th & Ruby Anniversary party on Saturday & my 2 brothers & 2 sisters & I organised it all & as well as doing a couple of surprises for them! First surprise was a 'This is you Life' using a projector so eveyone could see funny pictures etc! Then later on us 5 kids were the entertainment!! We'd been gathering together every Sunday for past few weeks to practice a dance we made up to Jackson's Five 'I want you back' & the Thriller dance. I have it on video so may up load it later if you wanna laugh!! 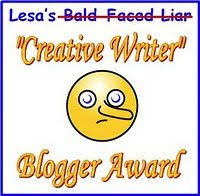 Post the award on your blog and tell 6 outrageous lies and 1 truth about yourself, or switch it to the other way round & then pass onto 7 buddies. I'm as fit as a fiddle & very healthy!!!! Now 7 buddies to pass this onto........I have lots of buddies & I know its the easy way out, but because I really appreciated everyones comments sooo much & your overwhelming support I would like to give this to as many people would like it who visit me.